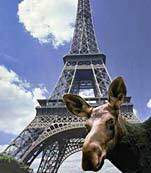 goMoose: Your one-stop center for Moose info, trivia, fun, photos, contests, nonsense & more! fun, photos, contests, nonsense & more. © • ™ • ® • etc. 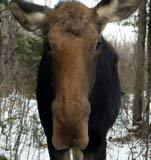 Mating season lasts from mid-sept - Oct.
for some Moose Viewing and Need a Place to Stay? There are also timeshare rentals available in the White Mountains - a great lodging option for when you're exploring the White Mountains and looking for moose! Moose Sightings can happen from your car! 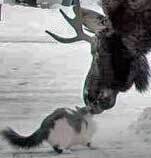 Watch out for moose running along the road. 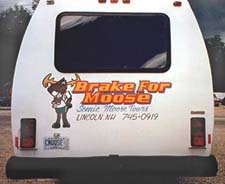 Use caution when pulling off, taking care not to startle either the moose or other drivers. 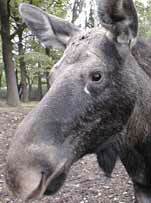 Be aware that this dark-colored animal does not show up well at night. A Moose in the House!